A week ago the Occupy London protesters at St Paul’s Cathedral had a strong level of public support. This seems impressively high. Only two in five saying that there is no practical alternative to capitalism is certainly at odds with the dominant view in the media. But this isn’t the same as finding support for the way the protest is unfolding, and opinion may well have changed since the poll was conducted. The day after the fieldwork, the Telegraph was the first to run with the claim that nine in ten of the tents are empty overnight. Along with repeated stories of ordinary people’s lives being disrupted, the coverage has also targeted the supposed wealth of some of the protesters to suggest that they’re out of touch or hypocritical. The thing is, this was all utterly predictable. After one day of most protests there will always be some bad headlines for the protesters, but barring disaster there’ll also be some positive ones. But after several days of protest, the fact that there’s a protest will no longer generate news: only the chaos will be of interest. After the coverage of the UK Uncut occupation of Fortnum and Mason, and the most recent Climate Camp, there should have been nothing surprising in the protests receiving this kind of negative coverage, especially if they went on for several days. The Fortnum and Mason protest also indicates the impact this can have on opinion. Before the TUC march, YouGov found that 84% of Labour voters thought the cuts were going too far or too fast. After the protest, only 64% of those same voters thought it was right for Ed Miliband to address the march. In the media disaster produced by that day, the protesters lost a sizeable chunk of those who should have been natural supporters. It seems fair to guess that exactly the same is currently happening with the St Paul’s protest. The impact of Giles Fraser’s resignation may put some pressure on the Cathedral, but there has been far more negative coverage of the protesters. If a poll in the next few days asks whether or not the protest at St Paul’s should continue, I would now expect to see a clear majority against it. 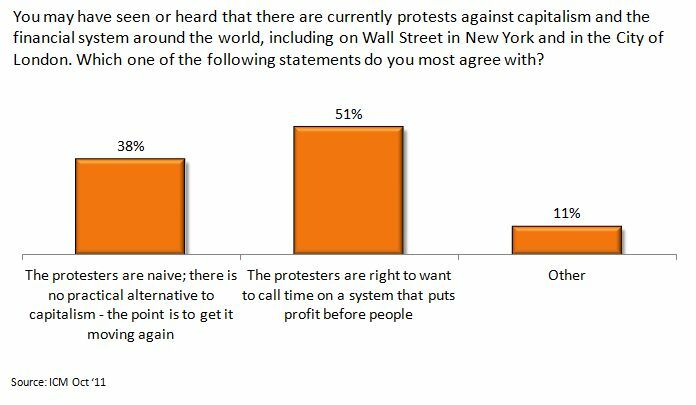 For a protest against a target as big and unpopular as global capitalism, that would not be a great achievement. This entry was posted on Thursday, October 27th, 2011 at 21:38	and is filed under Media, Protests. You can follow any responses to this entry through the RSS 2.0 feed. Both comments and pings are currently closed.